A film maker from North Somerset has made a film about a woman who fought in the French resistance during WWII. William Ennals' film tells the story of Andree Peel, who is now 103 and living in Long Ashton near Bristol. The young Andree Peel, then Andree Virot, lived in Brittany during the Nazi occupation of France. Under the code name "Rose", Mrs Peel saved many lives before being captured in 1943 and sent to Buchenwald concentration camp. Mrs Peel was initially involved in distributing secret newspapers during the occupation years but was soon promoted within the Resistance to head of an under-section. Agent "Rose" and her team used torches to guide allied planes to improvised landing strips and smuggled fugitive airmen onto submarines and gunboats. Mrs Peel has received many honours and medals including the Croix de Guerre, the American Medal of Freedom, and two Legions d'Honneur. She also received a personal letter from Winston Churchill congratulating her on her work. She was being lined up to be shot by firing squad at Buchenwald when the American army arrived to liberate the prisoners. She moved to Paris and found work in a restaurant where she met her future husband - an English academic called John Peel who took her to England. 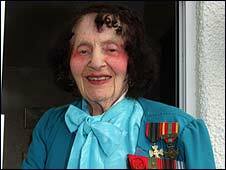 The film "Rose: A Portrait of a Resistance Fighter" can be seen at the Pierian Centre in Bristol on Sunday at 1930 BST. William Ennals, who produced and directed the film, will introduce the screening and answer questions.